Customer service (CS) is critical for delivering a great customer experience (CX). All too often, these terms are used interchangeably, but they are not synonymous—CS is not the same as CX. Customer service is part of the overall customer experience, not the entire customer experience. It is vital to understand the difference between CX and CS as you implement Voice of the Customer (VoC). Customer experience is the sum of all experiences, interactions, or touchpoints a customer has with a company. Customer service is employees at a company helping solve a customer’s need in some way, usually (but not always) around a problem or a question. CX is holistic and covers a wide number of touchpoints. Some of them are CS oriented, some are not. A complete VoC program includes all touchpoints, including those that are product or digitally oriented. 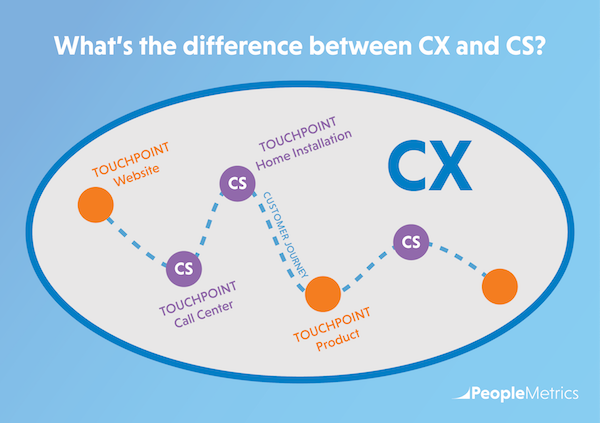 At PeopleMetrics, we use an exercise called touchpoint mapping to help our clients distinguish between CX and CS. When mapping out key touchpoints, we note which ones are CS oriented and which ones are not, but are still an important part of the customer experience. If you run through this valuable touchpoint mapping exercise at your organization, I bet you will find that many touchpoints that are key to the overall customer experience include more than just customer service. Be sure to distinguish between customer service and customer experience in your every day communication so that your team and broader organization understand the nuances and view CX holistically.